Hello! We are Antonio Fabiani and Mubaraq Durosimi, two final year BA Film students at Middlesex University and respectively Producer and Director of The Black Card , a 15-minute film. This film also happens to be our final year film project so counts towards our degree. We are both keen thriller fanatics and very passionate about our film project as it will cover issues that are very important to us, such and racism and injustice. We are very ambitious and with your help we hope The Black Card will be a well executed and visually compelling film. Written by our Director, Mubaraq Durosinmi, The Black Card follows the story of Isaiah, an ambitious young black 23-year old who works at an accounting firm. Isaiah is asked to work overtime by his mild-mannered boss, Pierce, 45. Isaiah likes his boss and thinks his boss likes him but while working alone after hours, he discovers a video. This video exposes his boss as a member of a “The Black Cult”, a racist cult responsible for killing black people. Following his discovery, Isaiah meets with his work colleague and friend, John, 24, and they go back to John's house. Unknown to Isaiah, he has been secretly drugged earlier on, resulting in an outer body and hallucinatory experience. Unsettled by his earlier discovery about his boss and while hallucinating, Isaiah stumbles across the Black Card but its meaning is unclear. Isaiah knows that somehow he is connected to this symbol of black people of the past and the racism they endured but its meaning remains shrouded in mystery. It is his job to solve the mystery of the Black Card and work out its intention for him, before it’s too late. At the same time as trying to reveal the Black Card’s true meaning, he struggles internally with how he is perceived by others as a result of his after hours discovery. Set in London, this story uses a unique angle to explore racism and its impact on people of colour. We believe that this is a very important topic to talk about given the racial prejudices many have to contend with in today’s climate. We felt it important to examine work place racism in particular. As it’s a thriller, we believe The Black Card will have you gripped as you wonder what’s coming next and how everything is connected! As with all film projects, there are costs involved. The money we require is relatively modest at £900 and we are hoping that with the help of generous donors, we will be able to hit this target. To help you see where any generous donations will be going, we have broken our budget into six key categories. 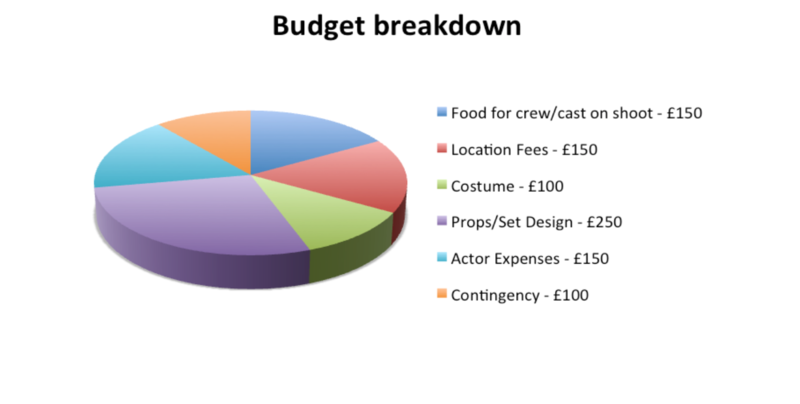 As you will see from the pie chart below, the biggest chunk of our budget will be spent on props and set design. We want to ensure we create a film that is visually powerful, highly atmospheric and ultimately something that we can be very proud of. Producer – Antonio Fabiani: For the past three years Antonio has studied cinematography avidly. in his past three years at Middlesex University. During the past couple of years has produced multiple short videos. Antonio has the vision and knowledge to make this short film a success. He believes strongly in the message behind The Black Card. Director - Mubaraq Durosimi: Mubaraq has directed many short films over the course of his three years at University. His vision is the most important. He wrote the script for The Black Card and has the drive to see the film through to the end. Given his experience directing many films, we are confident he will be able to overcome any challenges we face. Art Director - Zekaria Albostani: Zekaria has worked on numerous different productions and music videos as an Art Director. Examples of these are Team Salut Ft Naira Marley and Fredo Ft Not3s - YFS and Nike LDNR . DOP - Stephan Belov: Stephan is the DOP/Cinematographer for The Black Card . During his time at Middlesex University, he has honed his camera skills and developed a distinctive style. He has also acquired a wealth of experience having directed a few short films over the course of his time at Middlesex University. He has the passion and drive to see the project through to the end. Sound Design - Shabir Tawafi: Shabir will be doing Sound Design for the production. Having religiously practiced sound design while studying here at Middlesex University, we believe that he has become an extremely talented and capable Sound Designer. He is looking forward to making this film and helping to overcome any challenges that lie ahead! Editor - Lukas Sakavickas: Lukas has studied at Middlesex University for three years, focusing on Cinematography and Editing as his final major. He has credits in both fields. Like the rest of us, he is looking forward to the challenge of bringing The Black Card to screen. There are always risks and challenges when making a short film but we believe with the right crew, cast and pre-planning these can be overcome with relative ease. We have a fantastic crew in place, all capable of finding solutions to the most complex challenges and by planning in some contingency budget, we know we have a financial buffer to help us overcome any unforeseen hurdles. For more information, follow us on Twitter and help us spread the word! We will be adding updates to our crowdfunding page but you can also find our more about our progress with The Black Card and our crowdfunding campaign by following us on Twitter. Our Twitter handle is @fabianio124 . Even if you can’t donate personally to our campaign, you can still play a key role in our success by spreading the word about our campaign to your own contacts. The more people who know about our campaign, the more likely we are to hit our target. Obviously any money you are able to provide would be fantastic too! Thank you email from behalf of production ! Listed in the credits as sponsor ! Digital copy of finished movie ! Thank you email from behalf of production ! Listed in the credits as sponsor ! Digital copy of finished movie ! Digital copy of Artwork Listed in the credits as executive producer ! !